Spacious and charming Town Home featuring 3 Bedrooms and 2.5 Baths at one of Marathon Florida Keys most prestigious resorts, "INDIGO REEF"
Step out of your Luxurious Master Suite and step into INDIGO REEF's Paradise on your upper-level private deck which features magnificent views of the FLORIDA KEYS SUNSETS! 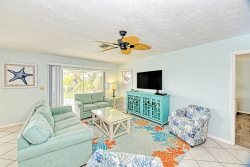 The unit is laid out beautifully with views of the Gulf of Mexico and the Islands of The FLORIDA KEYS from your deck. Inside you will find a fully equipped, modern kitchen with lots of granite counter top space, new stainless steel appliances; an elegant living room with 2 sitting chairs, 1 large sofa and a large flat screen TV; an extra large dining area with table and seating for six; and a convenient first level guest bath. On the second level, the Master Suite features a private Master Bathroom and the bedroom opens up to a spacious second level balcony. There are two more bedrooms on the second level; one with a Queen bed, and another with two Twin beds. There is also an additional guest bathroom for convenience and a Washer and Dryer closet. Ask about reduced rates ~ Honeymoon in The Florida Keys, and small family discounts for groups between 1 and 5. Docking - We can arrange Boat Trailer parking for you at a small charge and guide you to the best boat ramp for your needs. YOU MAY NOT ENTER RESORT GROUNDS WITH TRAILER PLEASE. Plan your trailer parking in advance. Bedrooms/Accommodates (3/6) - The master suite features a king mattress and the other two bedrooms feature a queen mattress and two twins respectively. New mattresses in all bedrooms 01-2018. This home will sleep 6 people comfortably, however, we can accommodate up to 8 people. Check with us to see if we have a rollaway bed available for rent.